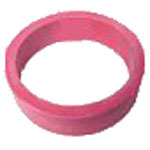 Large 2-inch inner-diameter red rubber ring for standard 3-inch long flippers. Measures 1-1/2 inches ID x 1/2-inch tall x 3/16-inch thick. Fits most makes/models. Replaces Bally #s R-406-3, R-533-1, R-533-3 & # 17-41-682, Midway #s 0017-00041-0653 & 0017-00041-0682, Williams # 23-6519-4, 23-6505, 23A-6505, Stern # 7A-121 & # 7A-121-1, Data East, Sega, Stern #s 545-5024-02, 545-5277-22, & 7A-121-R, Valley # 66-380-001, Zaccaria # A4245, and others.